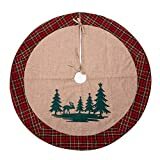 Size:42" Christmas tree skirt is made from classic burlap. Standing reindeer in the woodland collection makes tree skirt lively. Pop color of red, green,yellowand black make of tartan trendy border. Lace the perfect finishing touch under your Christmas tree. Beautifully detailed addition to your holiday decor. Metal Die Cut Moose & Deer Christmas Ornaments - (6 Pcs./set) 3 1/2" X 4"